One Door Polk, established by the City of Cedartown, in collaboration with Floyd Medical Center, Primary Healthcare Centers, Polk Family Connection, Cedartown-Polk County Hospital Authority and Highland Rivers Health, is poised to offer a full spectrum of social services under one roof in the heart of downtown Cedartown. 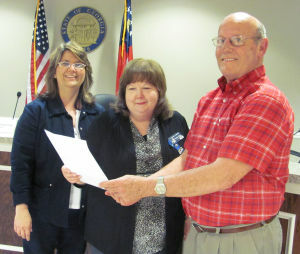 Planned for location at 424 North Main Street in Cedartown, One Door Polk will occupy the building that will be left vacant by the county’s current hospital, Polk Medical Center. The hospital is slated to move to its new location on US Hwy. 278 in the fall of 2014. Countless studies have shown that reading proficiency by third grade is the most significant predictor of high-school graduation and career success. Not one of the most—the most. It is at this crucial juncture in elementary school when a child transitions from learning to read to reading to learn, and if the student isn’t reading on grade level before entering the fourth grade, the consequences can be long term and significant. In Georgia, that translates to nearly 70 percent of students who are at risk of failing or dropping out of school. Low birthweight, childhood obesity, and a literacy gap are serious threats to the well-being of Georgia’s families and children. Recognizing the impact these pressing issues have on the state’s health, safety, and ability to prosper, Georgia Family Connection Partnership has launched three initiatives dedicated to developing and implementing strategies that address these key indicators.